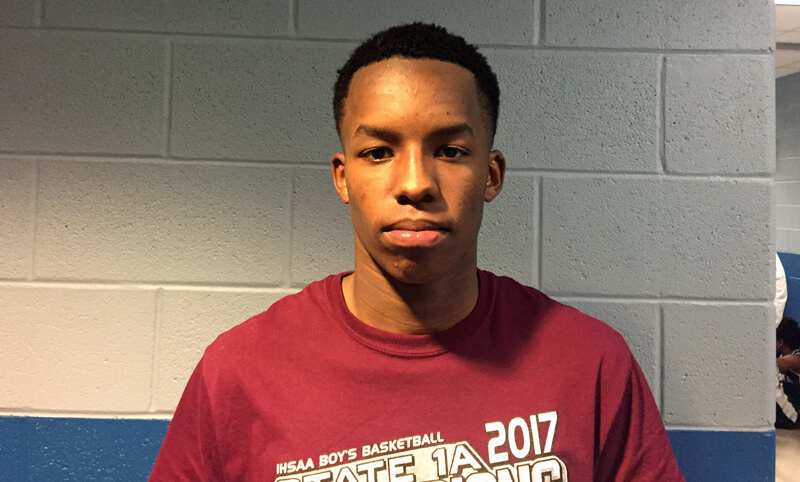 FORT WORTH, Texas – Class of 2018 Tindley guard Eric Hunter is excited to know where he stands with Indiana. Before last month’s coaching change in Bloomington, the 6-foot-3 lefty hard a time figuring out how serious the Hoosiers were about recruiting him. On April 17, Archie Miller and assistant coach Tom Ostrom made a trip to visit Hunter at his school and the IU staff watched him this weekend in the adidas Gauntlet in the Dallas area. It’s a welcome change for Hunter, who led Class A Tindley to a state championship last month at Bankers Life Fieldhouse. This spring and summer, Hunter is playing with Indiana Pros on the adidas Gauntlet silver circuit. On Saturday morning, Miller and assistant coach Ed Schilling both watched Hunter as did Chris Mack, Matt Painter and several Big Ten assistants, including Michael Lewis of Nebraska. The meeting last Monday with Miller and Ostrom gave Hunter a chance to become more familiar with the new coaching staff and what they plan to implement in Bloomington. In addition to the visit last week from Indiana, Hunter was visited at his school by Nebraska and Notre Dame. The four-star guard is rated the No. 105 prospect nationally by the 247Composite. Hunter said his recruitment is “completely open” at this point and also said he’s not planning to cut down to a smaller list of schools until the end of the summer. As a junior, he averaged more than 26 points for Tindley and shot better than 50 percent from behind the 3-point line. When it comes to making a decision, Hunter says he already has a pretty good idea of the factors that will matter the most to him. Taking big donations back then is just boomerang back at them, 40 years later. Long lunch and certainly not free. The Wharton professors must cringe every time he opens his mouth. So I will repeat my question because I am legitimately curious: are you bringing in information from other sources or just reading his statements completely different than I am? Thinks he’s 1 and done? Back it up or please delete because that is ridiculous to attack a 17 year old like that. If he had signed with another school already and said some crap about IU (or another school), I’d agree with you. He hasn’t. In fact, what he said was positive about Arch. I just don’t see what the beef is here. Leave it to a liberal to ruin a discussion about basketball. Liberals ruin everything they touch. A nod’s as good as a wink to a blind horse. Thank God this one shoots 50% from three with that vision. Seems the discussion had already deviated from the topic of basketball.